Fumaric acid (trans-butenedioic acid) is a multifunctional chemical with a diverse set of end uses, including food and beverages, rosin paper sizes, unsaturated polyester resins, alkyd resins, and animal feed. The food and beverages segment was the largest end use for fumaric acid in 2016, accounting for 35% of world consumption. In food and beverage applications, fumaric acid serves primarily as an acidulant; it is used to adjust pH, enhance flavor, and extend shelf life by controlling the growth of microorganisms. The food and beverages segment is expected to increase substantially during 2016-21, with growth driven in large part by rising demand in China and Other Asia. Increased urbanization, the expansion of the middle class, and changes in diets and lifestyles will lead to greater demand for packaged foods and a commensurate increase in acidulant consumption. In other regions, this segment is comparatively mature and consumption growth will be moderate. Other significant end uses for fumaric acid include unsaturated polyester resins (19% of world consumption), rosin paper sizes (18%), alkyd resins (11%), and animal feed (5%). In animal feed, fumaric acid functions as an acidulant; in other end uses, it is a raw material. Demand for fumaric acid in unsaturated polyester resins, and alkyd resins is greatly influenced by general economic conditions; both resins depend heavily on construction/remodeling activity (residential and nonresidential) and motor vehicle production. Global demand for unsaturated polyester resins is healthy, with especially robust growth in China. In contrast, global consumption of alkyd resins is growing at an anemic rate, weighed down by declining consumption in North America and Europe, primarily as a result of environmental regulations. Consumption of fumaric acid in rosin paper sizes is forecast to decline in North America and Europe during (2016-21) because of the increased use of alkaline papermaking. China and Other Asian countries will have moderate growth in consumption. 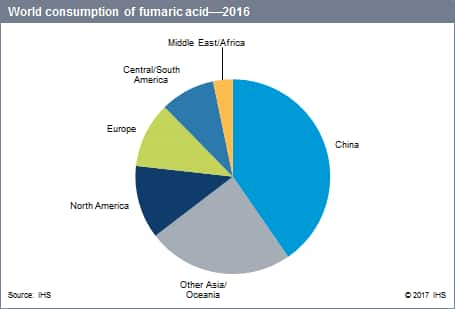 In 2016, China accounted for 74% of the world consumption of fumaric acid; Other Asia and Oceania consumed an additional 24% of the total. Growth in demand is highest in these markets because of the increasing demand for processed food and ready-to-drink beverages, improving living standards, and strong demand in construction/remodeling. Chinese demand is forecast to increase by 3.7% per year during 2016-21; increases in fumaric acid consumption in food and beverages and unsaturated polyester resins will account for most of the volume increase. Consumption in Other Asian countries is expected to grow by just over 3% per year during the forecast period, led by demand from the food and beverages segment. The fumaric acid industry is fragmented. No single producer has a capacity share of more than 7%, and the seven largest participants have a combined capacity share of less than 41%. Most large producers are back+integrated to raw materials (typically maleic anhydride) and forward-integrated into derivatives of fumaric acid such as DL+malic acid and unsaturated polyester resins.